Thanks to G.H. Cretors for sponsoring these Quick & Easy Holiday Appetizer Recipes. Whether you’re ready for them or not, the holidays are here. Only a couple of weeks past Thanksgiving and time feels like it’s on overdrive. At this point, the calendar is already starting to fill up faster than you can imagine as holiday parties, concerts, and dinners. Not that December isn’t busy for most families, around here December is arguably the busiest time of year. Not only do we have the typical social events and fun celebrations filling up our days and at least a dozen birthdays for extended friends and family, Brady’s birthday is three days before Christmas and my husband’s is a week after that. It’s a lot to keep up with everything. You want to enjoy all the moments and go to all the things but at this time of year, you can’t do it at the same level you might at other times. You still want to contribute an appetizer, but you don’t have the time to spend all day in the kitchen either. 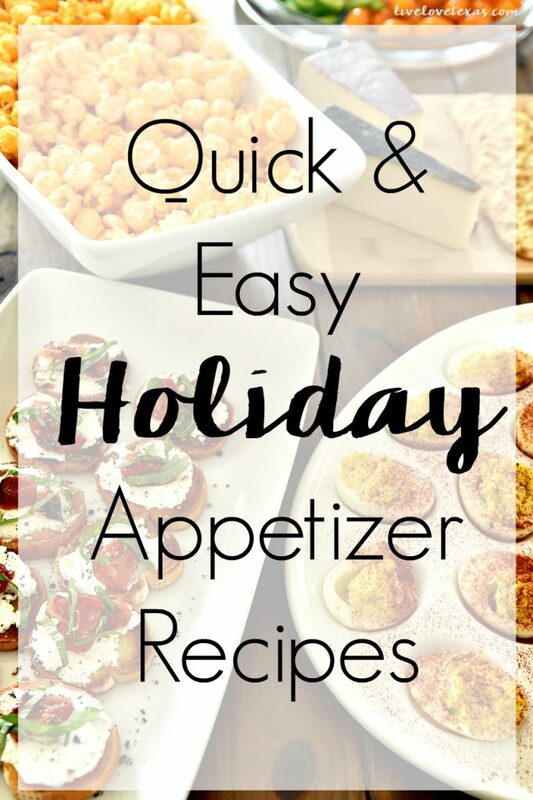 You’re looking for quick & easy holiday appetizer recipes that taste great to everyone and that don’t take up a bunch of your precious time. As someone with so many events going on in December, I’m the queen of trying to do it all. Here are my go to quick & easy holiday appetizer recipes that everyone will love and no one will ever guess you’re not spending a ton of time creating. 1. Veggie tray. Here’s an appetizer that’s sure to be at every party you attend and can easily be hacked. You can either buy all the veggies pre-sliced or save a little money slicing them yourself and putting them on a tray with some store bought hummus or ranch dip. 2. Cheese board. It doesn’t get any easier than cheese and crackers for appetizers. 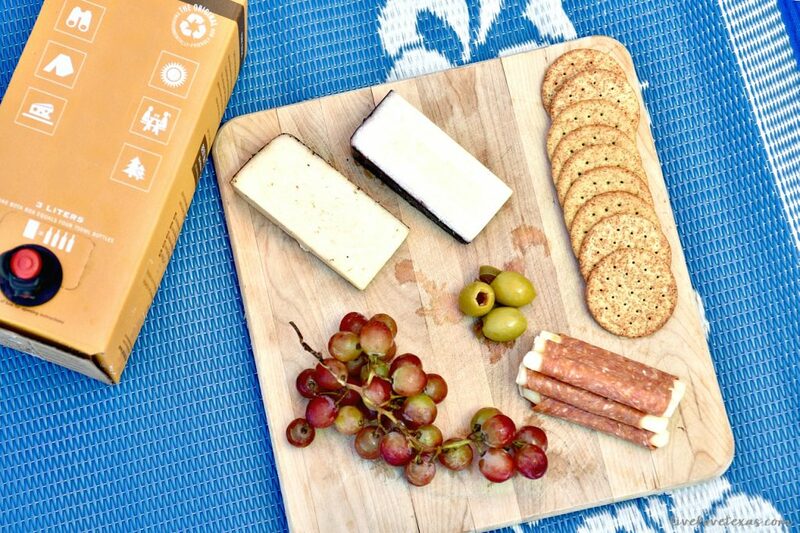 It’s my go to for everything from a beach picnic to a quick & easy holiday appetizer. While I always have the same types of ingredients, no two cheese boards are ever exactly the same. You can’t go wrong with mild, crusted cheese from the deli, pepperoni or salami for your meat, green or black olives, and seasonal fruits. Dried fruits, nuts, and chocolates can also be added to expand the possibilities and interest in this versatile appetizer. When time is a precious commodity, a cheese board becomes a staple for holiday appetizers as it comes together quickly and is so easy to customize to your guests and occasion. 3. Deviled eggs. I don’t know anyone that doesn’t like deviled eggs. We almost always have hard boiled eggs in our fridge as an easy breakfast or snack on the go. It’s such an easy way to get protein into your diet and is so portable. But boiling eggs and making deviled eggs is easier than you think and can easily be done while you’re doing other things. Something you may not realize is how easy it is to customize deviled eggs. You can dye the cooked and halved egg whites for the holidays by using water and food coloring to make a fun statement appetizer to your trusted recipe. Or, you can mix things up by adding different toppings to give each egg a unique flavor profile. Some of my favorite garnishes for deviled eggs are the following: chives, jalapeños, bacon, and paprika! 4. Crostini. The great thing about crostini or bruschetta is that it’s easy to make and the toppings can be modified for the occasion or meal. 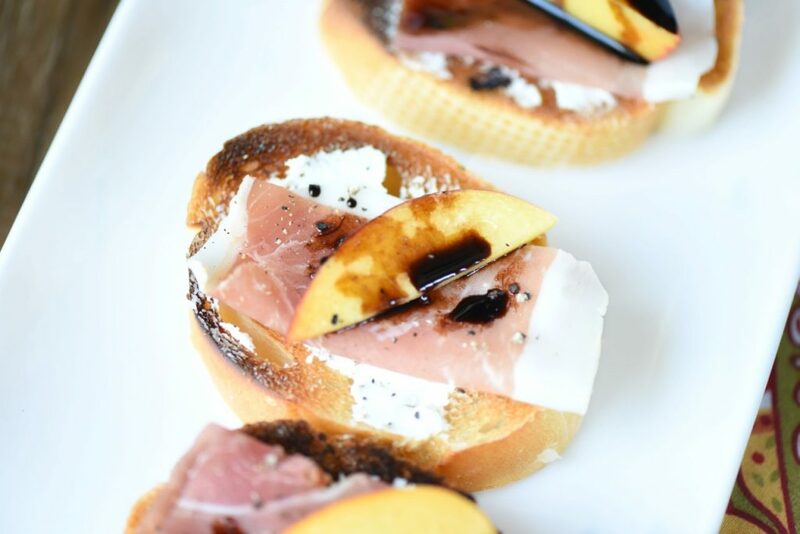 A peach and prosciutto crostini drizzled with balsamic vinegar can be a light and refreshing appetizer in the summer but during the holidays roasted tomatoes and sliced basil atop goat cheese crostini can make a festive and flavorful appearance! If you’ve never made your own crostini before, don’t be intimidated by this recipe. I promise it’s easier to make than you think. All of my crostini recipes start with room temperature goat cheese and a baguette from the deli that I slice, brush with olive oil, and broil until lightly toasted and golden brown. Then you’ll spread the room temperature goat cheese on the warmed bread and finish with your choice of toppings. I like to hit more than one area of the tongue at one time and often choose a fruit or vegetable, sometimes a meat, and always a complimentary garnish or finishing touch like balsamic vinegar, honey, or fresh herbs. The possibilities for crostini toppings are endless! 5. G.H. Cretors Popped Corn. By far the easiest appetizer you should always keep on hand for holiday entertaining is G.H. Cretors Popped Corn in a variety of flavors. Just place it in a large serving bowl and you have an instant appetizer that’s full of flavor and crunch! 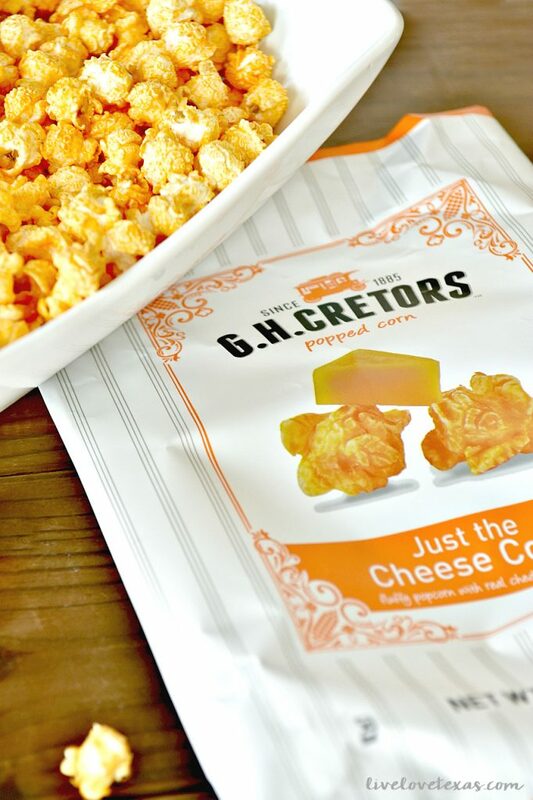 You can’t go wrong with any of the G. H. Cretors Popped Corn varieties and there’s something for everyone! From the savory like the Organic Chile Jalapeno White Cheddar to the sweet of the Just the Caramel Corn to the unexpected, like in The Mix which combines caramel corn with aged cheddar cheese corn, into an unlikely yet perfect pairing of flavors. And G.H. Cretors Popped Corn isn’t just for appetizers, it’s great to keep a stash in your car or purse during the holiday season for a quick snack while doing your holiday shopping, driving around to see the sights and sounds of the season, or while traveling! Find more quick & easy holiday appetizer recipes and learn more about G.H. Cretors Popped Corn and find a store near you by checking out their website and stay updated on the latest product news, recipes, and ideas by following them on Twitter, Facebook, Pinterest, and Instagram!